Our Christmas Party Apparel will bring a smile to the biggest Christmas grump! Just plop a santa hat, reindeer antlers, elf hat, or turkey hat on your head and your scrooge won't be able to hold back a smile! From the classic Red Velvet Santa hat to reindeer antlers we have the Christmas apparel that is fun to wear. 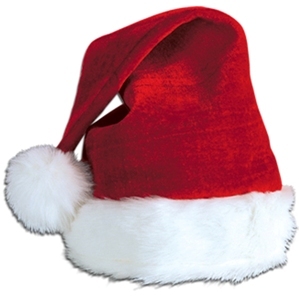 Grab enough Santa hats for you and your group when you go out singing this Christmas. Along with lots of Santa hats for you to choose from we also have Santa's little helper accessories like the Felt Elf hat with Ears and the Felt Elf Hat with bells. Combine these elf related apparel items with the Official Elf Button and you are now an official member of Santa's crew. If you are looking for an all-in-one Santa Hat and Beard we have that so you can dress up as Santa for your company Christmas party or just wear it around town to keep the chill out. Add in the Santa eyeglasses and you are instantly dressed to had out goodies from your Christmas Gift Sack. We hope you have as much fun this Christmas dressing up as Santa Claus as the kids do seeing you bring toys their way! All of this Christmas party supplies is very festive and won't break your bank in the process! Show everyone you know that you are ready for the Christmas season by wearing some of our great Christmas Apparel! Grab some Santa hats for you and your group to wear for a Christmas parade, or even wear them when you go out singing Christmas carols! Dress up for Christmas with the help of our collection of Santa hats. From the classic red velvet stocking cap to the new Santa hat with Lights, we are sure to have the hat that is perfect for your Christmas celebration. Check out the Santa scarf hat that is so long you can wrap it around you to keep your neck warm. If you are planning on dressing up as Santa for an event you may want to consider the all-in-one Santa Hat and Beard. And if you are going to dress up as Santa, you are certainly going to need some little helpers. So, make sure you pick up a soft plush elf hat. We even have an Elf Hat with Ears! Don't forget about the Elf Boots to complete your Santa's helper outfit. This Christmas party supplies is perfect for any Christmas occasion. From class room parties to Christmas parades we can fulfill all of your needs. Go all out with your Christmas Apparel and decorations because Christmas only occurs once a year!